Stericycle began in 1989, and has become a leading provider of regulated medical waste management services in North America, the UK, Brazil, Argentina, Chile, Ireland, Romania, Portugal, Spain and Japan. As medical waste regulations were adopted to protect the public, we saw the opportunity to manage medical waste for a wide variety of healthcare customers far more efficiently than they could on their own � and in compliance with local regulations. Moreover, we developed a patented treatment process that is safe, clean and reduces the volume of medical waste in landfills. Stericycle�s core purpose is to help customers fulfill their promise by providing solutions that protect people and brands, promote health and safeguard the environment. Once the initial characterization is complete, we�ll implement a process to update your hospital�s waste characterization on an ongoing basis as new drugs are added to your formulary. Stericycle provides extensive training throughout the hospital as required by EPA and DOT to ensure compliance with the pharmaceutical waste service both during the implementation and beyond. For program rollout, a team of Healthcare Compliance Specialists will be on site to provide training to each department, specific to the needs of that department, in a unit to unit and classroom setting. To support ongoing training for part-time staff, employees on vacation, new hires, ect., Stericycle offers an extensive Train the Trainer program with supporting documents, posters, CD�s and other tools to reinforce the training message. Stericycle transports filled boxes and drums of pharmaceutical waste to the appropriate destruction facility. Non-RCRA pharmaceutical waste is transported to an incinerator that is permitted for non-RCRA pharmaceutical waste. RCRA Rx waste is transported to a RCRA waste incinerator. When outsourcing your pharmaceutical waste handling, you need to be confident that your vendor will meet or exceed your hospital�s risk management standards as well as all governmental regulations. The Stericycle transportation vehicles that service your facility must pass routine safety inspections. They always have the appropriate licensure, permits, and insurance; and documentation is always readily available to you. 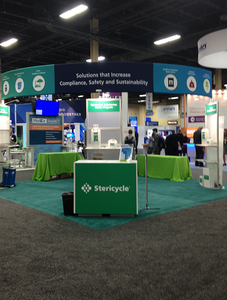 Stericycle ensures the highest levels of compliance, and the least amount of risk for your hospital. 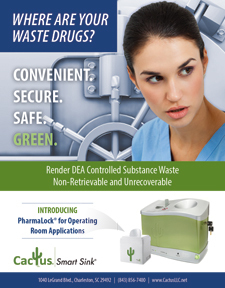 For most hospitals, capturing controlled substance� waste is a challenging process that poses a high risk of diversion if not done properly. Pharmacy Directors and other health facility professionals are now responsible for ensuring that leftover or unused drugs and drug waste are not taken or used by anyone other than the intended patient. This has become increasingly difficult due to the easy access and the inventive ways some abusers have found to obtain controlled substances for personal use. According to the National Council of State Boards of Nursing, approximately 15% of health care professionals struggle with drug dependence at some point in their careers. Workers who abuse controlled substances while at the hospital will have impaired judgement and skills, further increasing the risk that their actions could have an adverse effect on patients. We have developed a Controlled Substance Waste program, the CsRx System, for hospitals to enhance their existing security procedures to safely dispose of controlled substance in a safe and efficient manner and help prevent diversion. 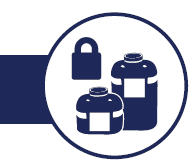 Each Stericycle CsRx container will contain a pre-loaded deactivating agent-deterrent, which will require water be added to activate. Once the deactivating agent-deterrent has been activated, the containers are ready for use. The deactivating agent permanently alters the substance�s chemical condition rendering the substance unavailable and unusable; including pills, patches, tablets and IV solutions. The deactivating agent also works as a precautionary measure deterring the improbable occurrence of someone attempting to ingest the liquid. 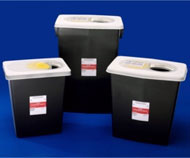 The CsRx System includes a pre-paid shipping box for final disposal of full containers. The closing security measure includes a fast-acting solidifier for each container to solidify the liquid prior to shipment. All controlled substance waste will be incinerated at a permitted Stericycle facility. Disposing of controlled-substance waste can be problematic for both consumers and the healthcare industry. It must be performed in a manner that prevents diversion of controlled substances and meets DEA regulations. The DEA regulations can be confusing and if controlled-substances disposal is not handled correctly, the risk of fines and other DEA corrective action can come into play. Stericycle now has safe and secure methods for hospitals to securely dispose of controlled-substance waste in a compliant manner. The system is built on three key components: a deactivating and deterring agent, a secure container with wall brackets, and a method for safely disposing of the waste. Stericycle CsRx controlled-substance waste diversion prevention service can help you safely and securely dispose of controlled-substance waste. We�ve made it simple, safer and more cost effective than any other option available. For over 25 years, Guaranteed Returns has provided pharmaceutical return services to hospital, government, independent retail, chain-store, LTC, Mail-Order and clinic pharmacies. Local GRx on-site service representatives are highly valued by customers for their professionalism, trustworthiness and for �going above and beyond�. Guaranteed Returns puts their longevity and industry knowledge to work to obtain the maximum amount of credits for every pharmacy return. 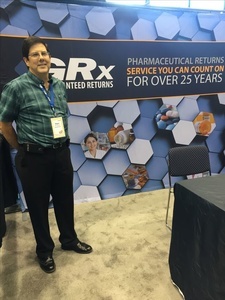 GRx concentrates on providing pharmaceutical return solutions that address all aspects of the business, beginning with the manufacturer, through crediting the customer. Business review consultations, inventory management assistance and an unbeatable customer service department are just a few of the attributes that customers say sets GRx apart. Their flagship program, ReverseLink One� has been branded as �the most cost effective return goods program ever to be offered by any 3rd party returns company�. Guaranteed Returns is dedicated to making pharmaceutical returns as simple as possible for customers while attaining the maximum amount of credits. Guaranteed Returns puts their 25 years of knowledge to work every day � continually investing in new programs, technologies and people - which is why GRx delivers Service You Can Count On. NPR offers FREE tracking of credits. NPR offers FREE shipping to the manufacturers. NPR offers FREE comprehensive reports that you can use for tax purposes (reports also available online). NPR offers FREE use of NPR's holding morgue for in-dated products with the potential of future credit. NPR is licensed to receive Schedule I drugs along with Schedule II-Vs.
NPR offers FREE 222 forms. NPR�s secure website allows you to bar code scan your inventory. All drug information is auto-filled. All you have to do is fill in your quantities. NPR realizes the importance of staying in full regulatory compliance. This not only protects NPR, but our customers as well. All products marked for destruction are destroyed by means of incineration and within all regulatory guidelines. NPR is licensed as a Large Quantity Hazardous Waste Generator. All return companies should have this classification and be able to provide proof. NPR is in full compliance with: DEA, EPA, OSHA, DOT, VAWD and Individual State regulations. Please call one of our Customer Care Representatives to see how we can help you today and in the future. 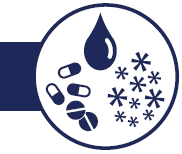 Clean Harbors provides comprehensive collection and disposal services for safe pharmaceutical waste management. Pharmaceutical Waste Characterization - We provide a comprehensive review of hospital pharmacy products and compounded formulas. Our formulary characterization accurately determines EPA, RCRA, and DOT requirements for each National Drug Code (NDC) product. Pharmaceutical waste characterization is particularly critical for chemotherapy agents, U-listed and P-listed hazardous waste. 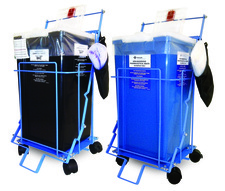 Satellite Accumulation Area Collection - Clean Harbors provides pharmaceutical waste collection container systems in the pharmacy and patient care areas. 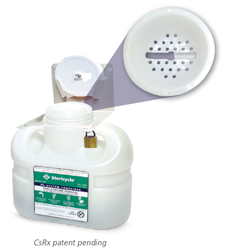 Disposable and reusable containers are used to properly separate pharmaceutical waste from biological or solid waste. Clean Harbors manages the collection and replacement of the pharmaceutical waste management containers on their scheduled service visits. Main Accumulation Area Management - Clean Harbors properly segregates all pharmaceutical waste to comply with appropriate DOT requirements, and packages the pharmaceutical waste products for transport. All of the necessary regulatory documentation will be administrated by Clean Harbors. Transportation & Disposal - Clean Harbors service vehicles pick up your pharmaceutical waste and transport it to company owned and operated facilities. Clean Harbors provides turnkey H1N1 Vaccination Incineration Services for healthcare facilities including hospitals, clinics, urgent care, and physicians� offices. With a shelf life of 18 to 24 months, H1N1 vaccine inventories dated at the end of 2008 and early 2009 are now requiring proper disposal by incineration. Since outdated vaccines do not have value, they are not managed through Reverse Distributors. Clean Harbors provide safe and complete disposal of chemotherapy agents. 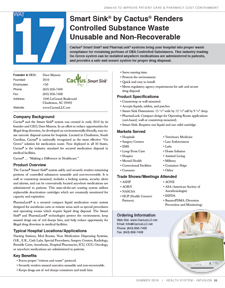 U-Listed waste including chlorambucil, cyclophosphamide, daunomycin, diethylstilbestrol, melphalan, mitomycin C, streptozotocin, and uracil mustard and other non-antineoplastic pharmaceuticals, such as reserpine, selenium sulfide, resorcinol, saccharin, and chloral hydrate materials are easily handled through Clean Harbors� network of waste disposal facilities. As a registered DEA Pharmaceutical Reverse Distributor, Clean Harbors provides an effective solution for managing Schedule I-V Controlled Substances from the initial pickup to transportation and complete destruction. Clean Harbors assumes full chain-of-custody ownership of these regulated substances at the customer site. 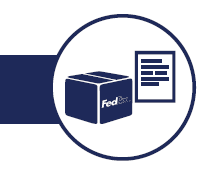 We complete the administration of agency required shipping and receiving documentation, and as a cost savings, eliminate the need for a customer to witness the destruction of the controlled substances. We complete all the various forms and paperwork including, but not limited to, DEA Form 222 (for Schedule I and II) or Form 41 (for Schedule III, IV, V substances). 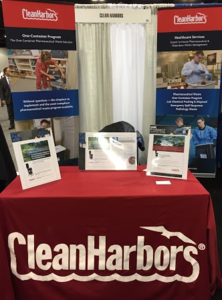 Clean Harbors CleanPack® Laboratory Chemical Packing Services provide proper recognition, handling, packaging, transportation and disposal of laboratory chemicals for healthcare facilities. We also perform laboratory relocations, closures and cleanouts. OneContainer , Simple. No Worries. The highest level of technology. Best of all - full compliance. 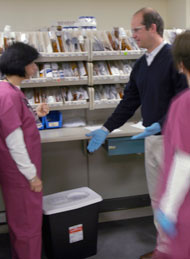 Pharmaceutical waste exists throughout the hospital and can be a challenge to manage. Stericycle makes it simple. Where are your waste drugs?